WATERLOO - Ann L. Bradfield, 97, died Thursday, May 8, 2014, at Northcrest Nursing Home, Waterloo. She was born Dec. 16, 1916, in Fort Collins, Colo., daughter of Benjamin H. and Selma A. Patrick Brashear. She married Vern Bradfield on July 3, 1942, in Kahoka, Mo. He preceded her in death on Sept. 22, 1959. She graduated from high school in 1934 in Blockton, Iowa, and attended Iowa State Teachers College for two years. She worked at Chamberlain Manufacturing for 40 years as an inspector and then a clerk typist, retiring in 1982. 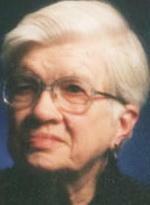 She was a member of Central Christian Church, Waterloo, where she was an elder emeritus. She was a member of Church Women United and received the Valiant Woman’s award. Ann also was active in the King’s Daughters and Sons, Daughters of Union Veterans, Machinist Union 134 and Allen Hospital Auxiliary, and was presented with the Mayor’s Volunteer Award in 1989. Survived by cousins, nieces, nephews; and her Central Christian Church family. Services: 10:30 a.m. Tuesday at Central Christian Church in Waterloo, preceded by an hour of visitation, with burial in Garden of Memories. Locke Funeral Home is in charge of the arrangements.